This week is a double-review! 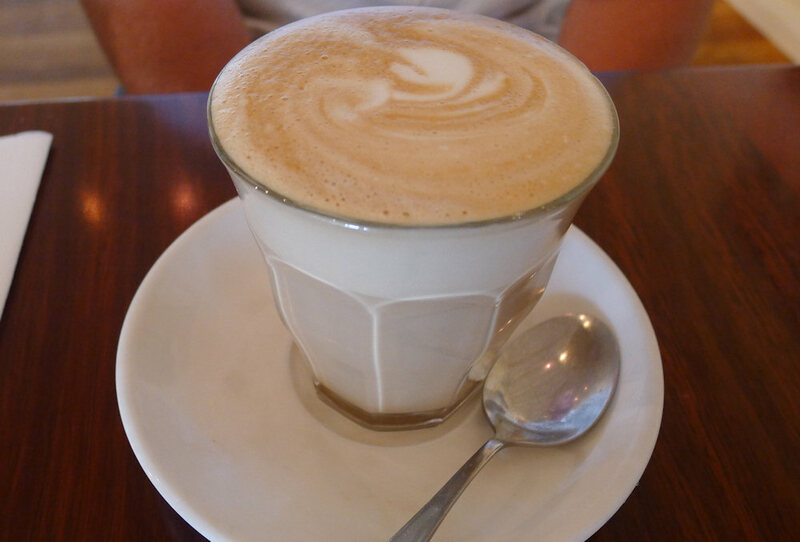 Dane visited Kurrajong while April reviewed a café in Port Macquarie. 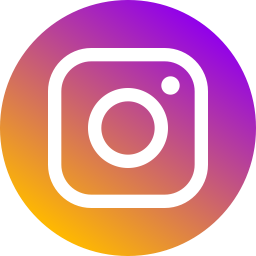 So come with me fellow SOSers as we leave the fumes and franticness of Sydney and drive about one hour north-west to the wide-open spaces, antique stores and fresh produce markets of Kurrajong. 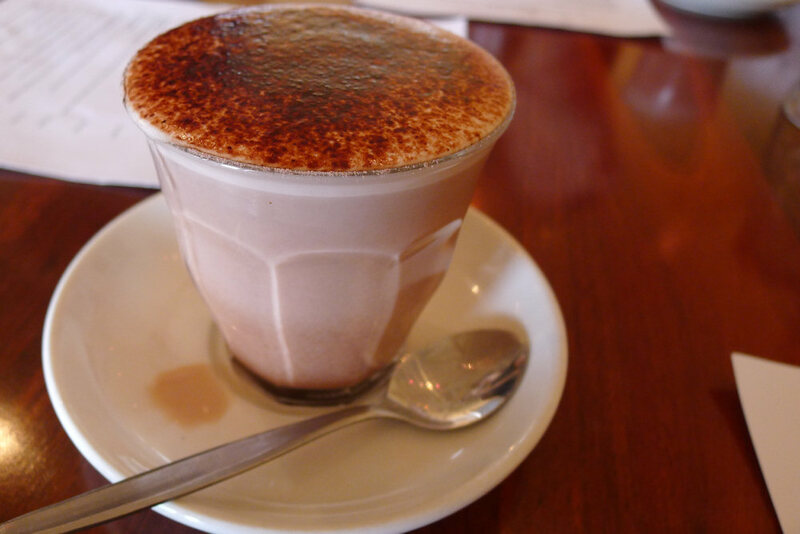 Sassafras Creek is a restaurant in Kurrajong Village on Old Bells Line of Road that is open for breakfast and lunch from Tuesday to Sunday (9am to 5 pm) and for dinner on Friday and Saturday nights (from 6:30pm). There are two tables outside at the entrance, expansive interior dining and a balcony overlooking the valley with three tables. We had booked a table for six people and were seated immediately by the waitstaff. Glasses for water were at the table with chilled water brought to us later. 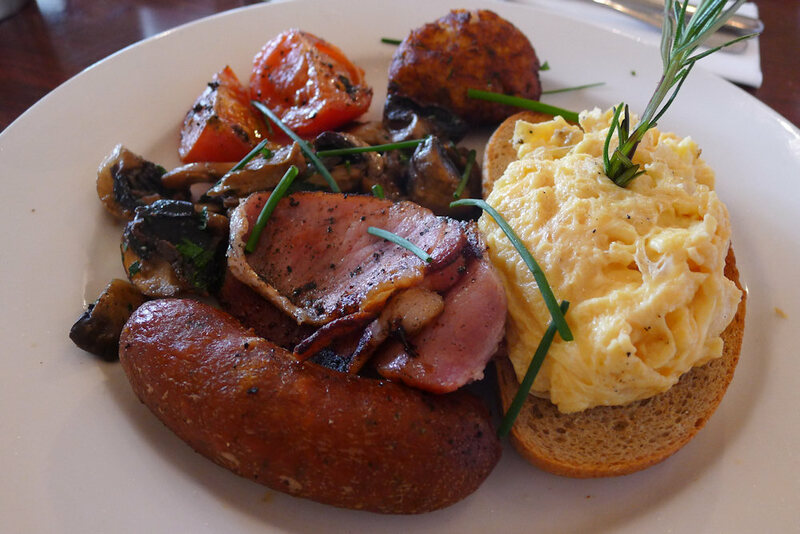 Sassafras Creek uses free range eggs and locally smoked bacon. The two guests who ordered hot chocolate ($3.50 or $4.50 in a mug) definitely enjoy it. One found some sugar necessary and the serving size was slightly small for $3.50. 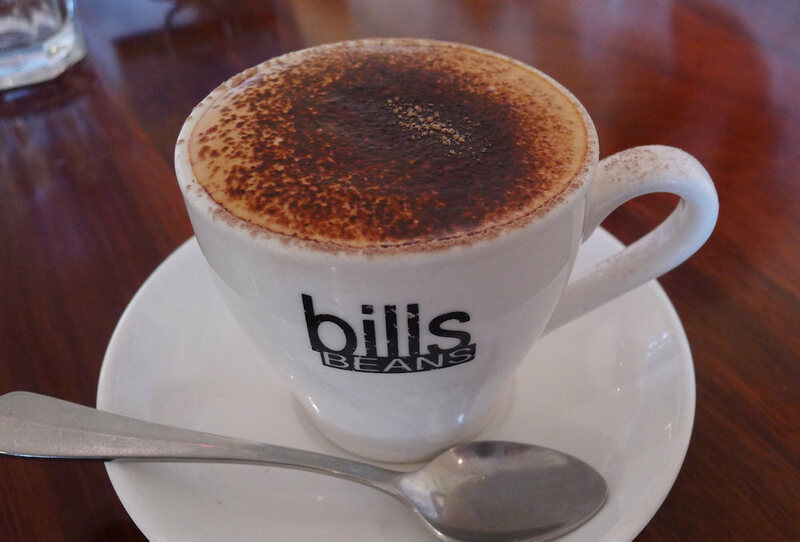 All of the coffee drinkers at the table agreed that the coffees served were fantastic. Coffees are $3 with the exception of the mocha ($3.50) and all are available in mugs. I felt like having my usual strawberry smoothie with fresh fruit however the strawberry flavour was only available in a milkshake. 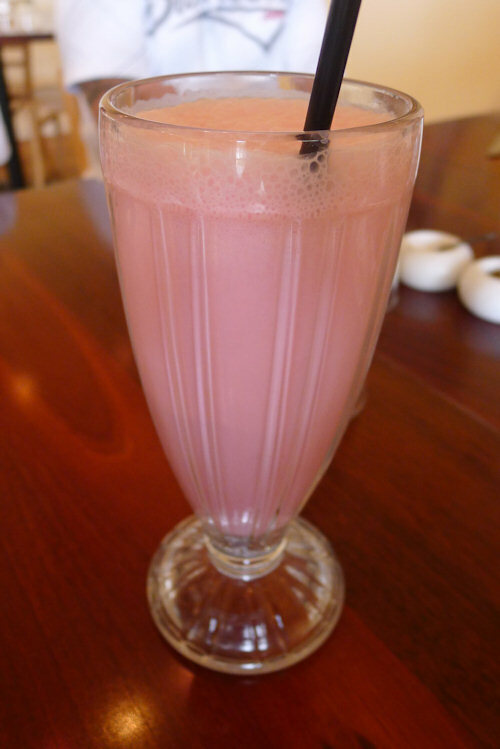 The strawberry milkshake ($4.50) was large and sweet but was in need of some more ice cream to thicken and cool it. 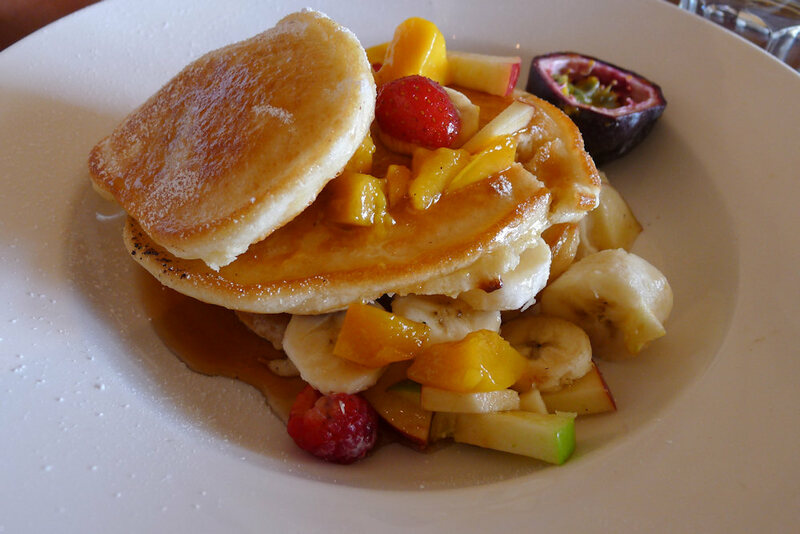 These pancakes ($12) were the hit of the morning. Sweet tooth or not, those who tried this dish preferred it to their own! The fresh fruit, maple syrup and honey was in abundance. The passionfruit was slightly sour but this was not enough to diminish the accolades this dish received! The chefs big breakfast ($17) was made up of some well prepared ingredients. The bacon, tomato and sautéed mushrooms received the thumbs up. Also included was hashbrowns, sausage, any-style eggs and toasted sourdough making for a comprehensive breakfast! The fitness breakfast ($14) is waiting to make you feel better about yourself! 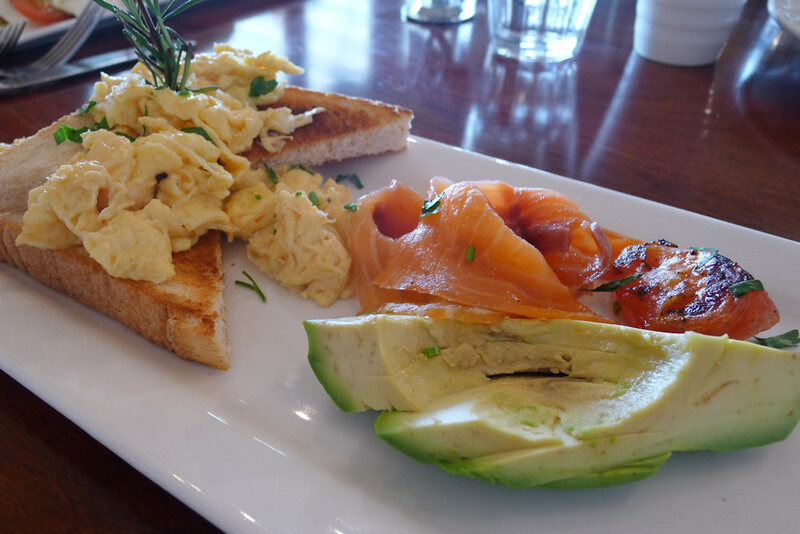 The dish includes one egg (any style), avocado, tomato, smoked salmon and toast. The orderer received the eggs as she had requested (well done) and the size of this meal seems perfect for those who want a hot breakfast that is not too large. 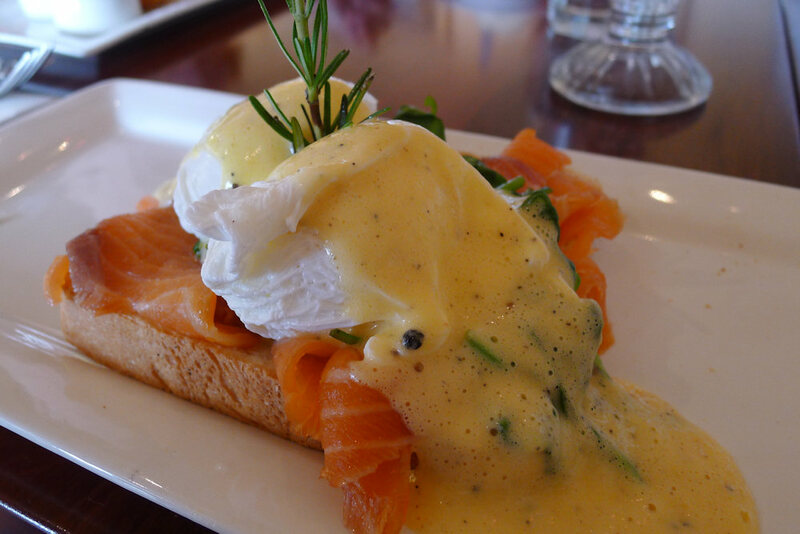 The Tasmanian breakfast ($17) is a variation of eggs Florentine with smoked salmon added and was surprisingly expensive for its size and contents. The sourdough bread was soft with a layer of cooked spinach and a large amount of fresh smoked salmon. The yolks of the free range poached eggs looked distinctly different to those I normally eat being very light in colour. The eggs had been cooked to the stage where the yolks were beginning to harden but were still runny. The hollandaise sauce was slightly salty and did not seem to have enough lemon. 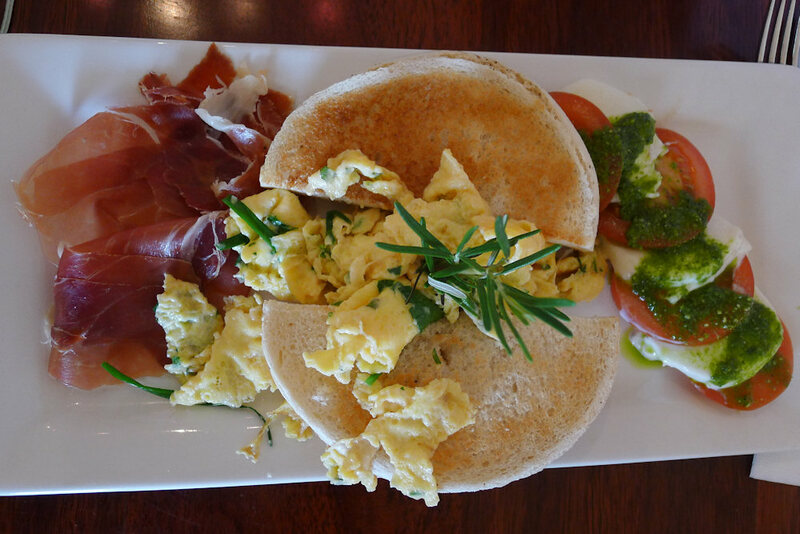 The Italian breakfast ($16) contains scrambled eggs with chives, tomato, mozarella & basil, prosciutto and toasted focaccia. As with the other meals, this dish was well presented. The focaccia was very thick and there was a decent amount of prosciutto. The tomato and mozzarella was fresh and provided a good flavour combination. It’s always nice to see something unique on a menu. For me this week it was the French breakfast ($14). 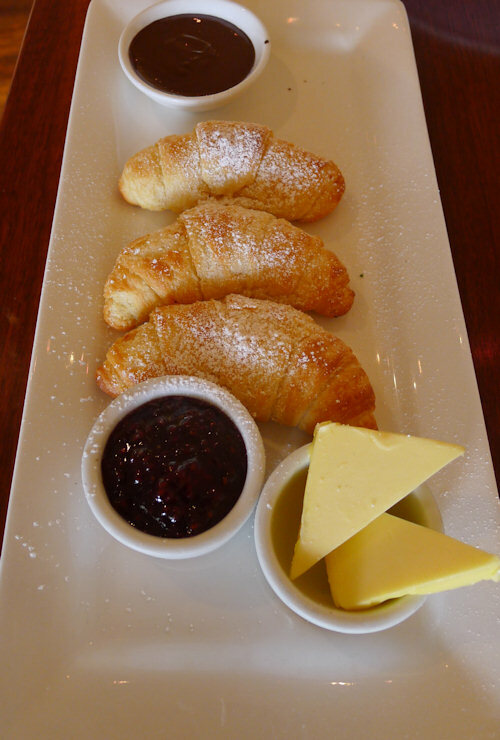 The star of this dish was the freshly baked croissants. They are presented beautifully with servings of warm chocolate and Enniskillen seasonal jam. 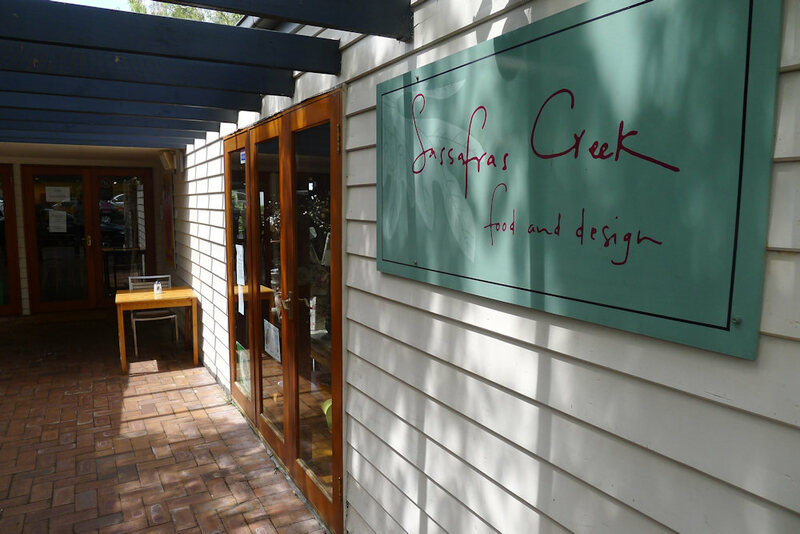 “Refined dining in lush surroundings” is how I would best describe Sassafras Creek. Value and pricing was a mixed bag for me as some dishes were very reasonable while others were quite expensive. I would attribute this to the price differences in freighting various produce versus obtaining others locally. The service was prompt and polite and the interior was subdued and relaxed. This may change later in the day as the café gets busier however! 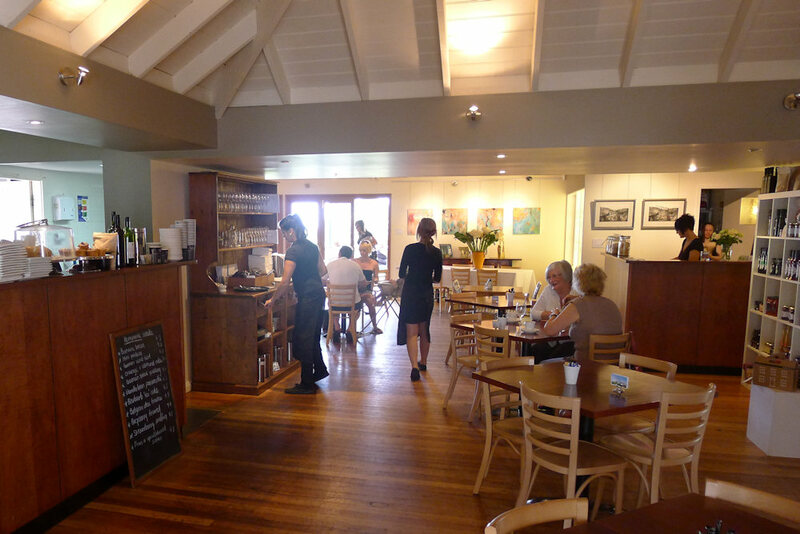 There are at least three antique stores in the area and the Sassafras Creek gallery which is attached to the café itself. The area is also home to the Fernbrook Garden and Botanical Art Gallery and Kurrajong Radio Museum so make a day of it! This entry was posted in Regional New South Wales and tagged Outdoor seating. Bookmark the permalink.